I watch the evening news. And, I'm convinced they shouldn't no longer call it evening news, friends, they should call it: The Anxiety Hour. Do you watch it too? Do you feel it crawl all over you? You see the tears. You see the evil. You see the injustice. You see the pain. You see the prognosis. You see no answers. You feel helpless. Yet, is this what Jesus called us to? Self-preservation and dread? Worry and anxiety? Might we consider: The news is not evil, but how our heart distrusts God easily could be? 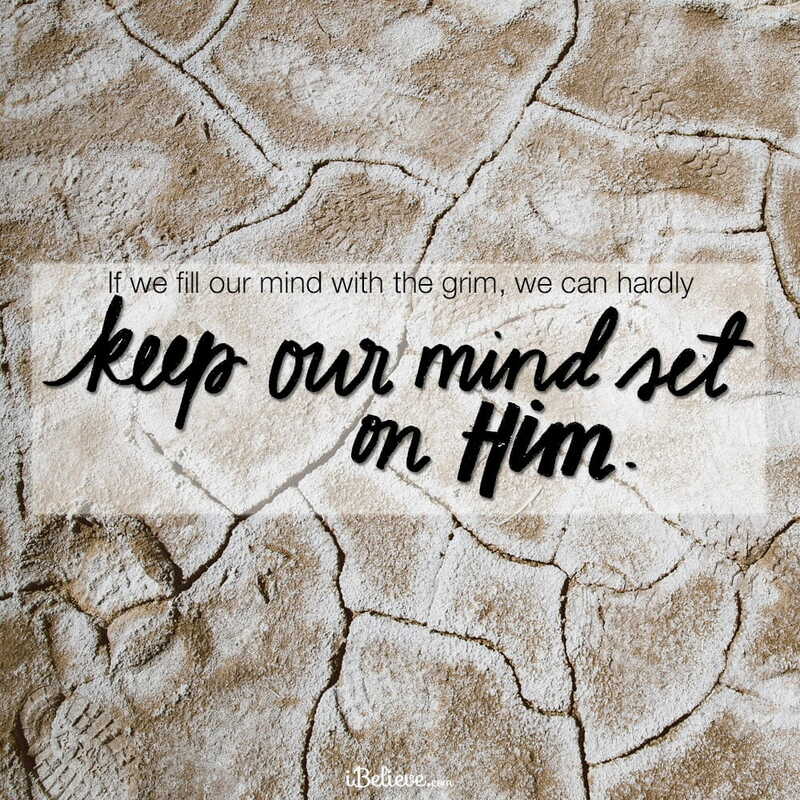 If we fill our mind with the grim, we can hardly keep our mind set on Him. We can't see if we are blinded by the anger that boils over in our heart. We get distracted and what emerges doesn't look like love. It doesn't look like Jesus. And what hits me is this: Jesus never called us hone in on what's wrong with everything, he called us to remember God is in control - of everything. This is peace. Dear God, I am prone to worry. I let the happenings of the world, the elections and the economy sit heavy on me. I need to find your peace. I invite you to restructure my thinking. May my hope be you. May my peace be you. May you help love flow out from me. Give me clarity. May I change what I am able to change and release what I can't. May I know that the greatest joy is staying where you are. God, thank you that you have the whole world in your hands. I need not fear because you are the best manager, orchestrator and caretaker. You made it all. I believe in your plan. Amen. Editor’s Note: Content taken from “5 Verses to Reclaim Calm When the World Makes You Anxious” by Kelly Balarie. You can read that piece in full here. All rights reserved.